Provide comfort for the family of James "Jim" Costello with a meaningful gesture of sympathy. 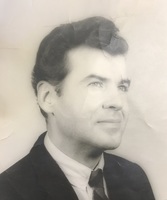 James "Jim" P. Costello died peacefully at home on February 19, 2019, after a brief illness. He was born in Cleveland, Ohio on April 20, 1932, to James and Kathryn (Dwyer) Costello, and raised in the Collinwood neighborhood of Cleveland. He was graduated from Collinwood High School in 1951 and he later attended Kent State University. Jim worked at the Lindsay Wire Weaving Company with his father and was a member of the Cleveland District No. 2 American Wire Weavers’ Protective Association. He served in the United States Army during the Korean War and was stationed in France and Germany. After discharge from the Army, he settled in Clearwater, Florida, where he owned different businesses, including a children’s’ shoe store, a motel on Clearwater Beach, a laundromat, as well as a water well drilling company. Jim later returned to Ohio and settled in Ashland in the 1970s to be near his parents, his uncle, and his sister and her family. After moving to Ashland, he worked for Myers Laundry as a salesman. He enlisted in the Ohio National Guard in 1977 and was discharged in 1986 with the rank of E6 Staff Sargent. While in the Ohio National Guard, he served as a recruiter and broke records with his recruiting. Jim later purchased the Wagon Wheel bar, which he continually operated. More recently, he purchased a long-unused building on Cleveland avenue and converted it into a pizza and sub sandwich restaurant, called The Copper Top, which also operates as a lounge. Jim enjoyed collecting sailboat models and nautical paintings. This was inspired by his grandfather who was a captain of a ship on the Great Lakes. In addition to his pride of being an American, he was also very proud of his Irish heritage, collecting items made in Ireland, and reading Irish literature. He enjoyed art, history, music, and sharing stories about his family and growing up in Cleveland. He was well-read and very knowledgeable on numerous subjects. Jim had a quick wit and a good sense of humor. Jim was preceded in death by his parents, his uncle John Costello, his sister Kathryn "Katie" (Costello) Fowler, and his daughter Patricia O’Conner of Florida. He is survived by his son Terrence, grandson Dylan and granddaughter Jennifer, all of Florida, and seven nieces and nephews. Funeral services will be Saturday, March 2, 2019 at 11:00 a.m. in the Denbow-Gasche Funeral Home with Father Rod Kreidler officiating. Interment will be in Ashland Cemetery. Friends may call one hour prior to the service from 10:00 a.m. to 11:00 a.m. The family suggests that memorial contributions be made to St. Edward School, 433 Cottage Street, Ashland, Ohio 44805. 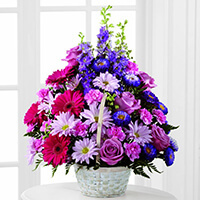 To send flowers in memory of James "Jim" P. Costello, please visit our Heartfelt Sympathies Store. Terry, Denise, Dylan, & Jennifer Costello sent flowers to the family of James "Jim" P. Costello. Terry, Denise, Dylan, & Jennifer Costello purchased the The FTD Pastel Peace Basket for the family of James "Jim" Costello. Jim was a real gentleman, and I enjoyed a number of conversations with him back from 08 till we moved to Flagstaff in 2015. David and Karen Samsel. You could discuss various topics with Jim, he loved to learn and also share his knowledge. He was a very unique and interesting person, when we we're younger we shared many memorable times together, I've never had a better friend..